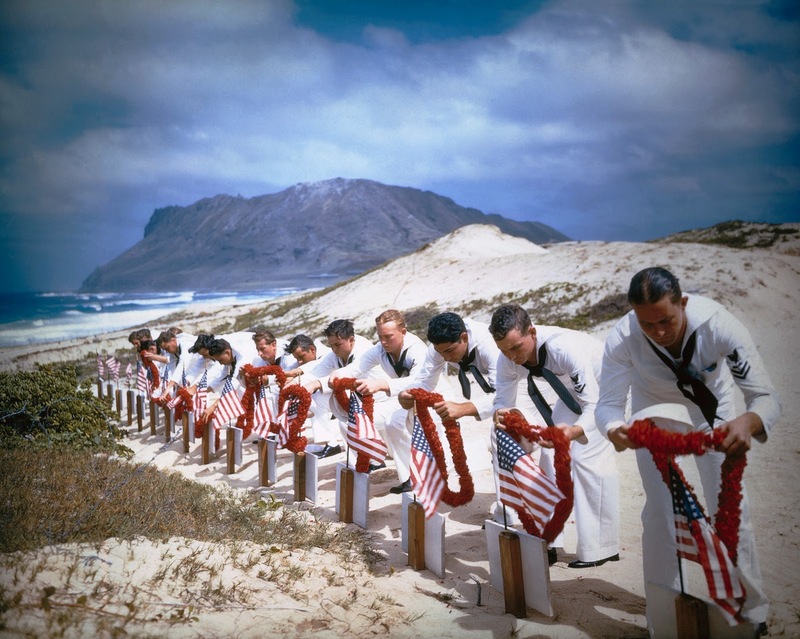 Once again, we remember our honored dead from the attack on Pearl Harbor, December 7, 1941. I've been thinking about how to write about this subject for some while now and do it in such a way that it doesn't come off as sanctimonious, preachy or whiny. I'm not sure I'm going to be able to strike the right balance, but I'm going to have a try at it. We've all heard how the "Great Recession" and subsequent recovery have been different from most that came before. Many of those who have lost jobs are still unemployed, are under-employed or have simply given up on the concept of "employment" as most of us are familiar with it. The U6 unemployment number, which includes all these types of unemployment, is a pretty ugly number compared to the usual U3 number quoted in the press. As of October 2017 the U6 is 7.9%. That a lot of people out of work, and it explains why the recovery really doesn't feel so great for so many people. I believe I've noted somewhere along the line that I lost my job a bit over a year ago. If I haven't, well, I did. I've also said things here and there about what I do, or more accurately, did, in the real world. Just to move this forward quickly, I worked in information technology, and I had the very good fortune to have worked my way up to the top of the food chain, being a Director of Information Technology. Bear in mind that in my case, I was a big fish in a smallish pond. A career in IT tends to spoil you, because IT people make some pretty stupid amounts of money. Even though I worked at a non-profit, which is at the low end of the IT pay range, I did better than most people. I was spoiled and I recognized that fact. Adding my earnings to Mrs. Freeholder's and a couple of unfortunate but (at least to me) substantial inheritances, and my family has lived a very middle class life style for 30 years. Believe me, all those gun show posts I've went to cost money, and it didn't grow on a tree in the back yard. The kids' educations and all the other stuff that a middle class life style calls for were also substantial outlays. The house, the cars, all that stuff takes money, and a lot of it. But I haven't forgotten that my parents both grew up in the Great Depression, and I remember the stories told on porches on warm West Virginia summer nights when we "went home" for a visit. Those stories--my Dad losing the $20 he had in a local bank when it failed, my Mom's family almost starving on several occasions, gardening and hunting for food and not for fun--have stuck with me. My granny washed and saved plastic bread bags, aluminum pie pans and the like because they might "come in handy one day." My grandma gardened and raised chickens nearly as long as she lived. She never owned a car and walked everywhere she went unless someone gave her a ride. She would never borrow money, a trait shared by all my grandparents. Living through a depression leaves some pretty substantial scars. I grew up with far more material goods than my parents did. We weren't poor by any stretch of the word--we never lacked for food or a home, the bills were always paid on time, and we had everything we needed and more than a few things we wanted. But we were far from middle class, even though my mother in particular aspired to be seen as belonging there. But by some government bureaucrat's definition, we were poor, and so we were. We never noticed it that much. As my children were growing up in the midst of true plenty, I tried to impart on them the things I had learned as a kid. I can't say how much effect that's had on them, since they've never really known anything but a middle class life style. They've had friends who didn't have that life, and they seem to have dealt with them just fine, not indulging themselves in any of the "We have more money than you do so we're better" business. Good thing, because I would have hated to gather all their crap up and hauled it to the Salvation Army. I went to high school with what I thought of as "snotty rich kids", which I now know were nothing more than middle class kids with poor raising, and I was determined that my kids were not going to act like that. One thing I remember saying as a postscript to a lot of stories about their great grandparents, grandparents or my own childhood has been "I grew up 'poor' and I have no doubt I will be 'poor' again some day." Boy has that one come home to roost after a fashion. My far ahead of scheduled retirement has been a wake up call. We aren't poor, and Lord willing, we never will be. We are still on a sound financial footing, but we can't live as we did 18 months ago. You can look back over the last year's posts and you'll note that the "I went to a gun show and I bought this" posts have disappeared. That's because I haven't been going to gun shows much, and I haven't been buying hardly at all. As a matter of fact, I'm starting to look at my accumulation with an eye to thinning the herd a bit. I didn't build a collection, really, I'm a lot like my uncle who infected my with gunny-itis--I accumulated guns. It's time to turn some of that accumulation back into cash. Fortunately, he also taught me to buy good guns cheap. I'll hopefully make a profit on everything I sell. That money will be funds my other hobbies, such as ham radio. My on again, off again antenna project is funded by that money. It would hardly be right to take money from the household income, to which I now only contribute a retirement check, to buy this stuff. And not as much stuff is being bought. I'm hanging onto that money a lot tighter than I used to. It's a lot harder to generate. We're fortunate that we had been making preparations for something like this for some time. I was concerned about my employer's financial stability for a couple of years preceding my exit, and that lead to our taking certain steps to be prepared for a quick descent into unemployment. Only a single major bill isn't paid off, and it's the smallest one we had. We can handle it. Other than the monthly expenses to run the house, we only have to pay groceries, auto expenses, taxes and insurance bills to keep even. That's been a huge blessing. We have examined our household expenses with an eye to economy. Cable TV is gone, replaced by the Netflix subscription we were already paying for, a Sling TV subscription and an antenna for the local stuff. We've invested in LED light bulbs and seen a measurable decrease in the electric bill, enough so that we paid for the bulbs in a few months. We plan trips better so that we drive less. In keeping with scratch cooking, we buy fewer processed foods, which is another savings. Things like magazine subscriptions, DVDs/Blu-Rays/CDs and the like also get a sharp eye before the money is spent. Oddly enough, we really don't miss any of the ones we're not buying any longer. I've also done a couple of small consulting gigs, something I haven't had time for in recent years. Those have brought in some extra coin, which has been handy. I'm hoping to do more. I'd love to go back to work, but the odds of that are declining by the day. IT can be a harsh employment environment, and my age and physical location are working against me. Relocation is out for reasons, and I can't get any younger (the picture in the attic isn't cooperating). I keep looking, but I'm realistic about my chances, which are declining by the month. I can spend more time on our investments (such as they are), just with the proviso that they are a lot smaller than they would have been, so there is much less room for error. I'm doing OK, but that constant knowing that a big mistake could kill us financially really forces you to not take some risks that you would have normally taken. But that safety comes at a cost, and you don't make the kind of returns you really would like to make. We find ourselves not doing things we're used to doing and that we'd like to do. The RV doesn't go out as often now. Movies and concerts are less common. Eating out is a treat, not how we get our food half the time. We spend more time shopping for good buys and bargains. We are more careful about what we buy--"O-o-oh shiny!" has pretty much went the way of the dodo around here. Besides, we're going to be downsizing in a few years. We need less junk in our lives, not more. We've also changed the amount of money we give the charity. That's went up. We discussed it, and our feeling was that the need was still out there and that we are still blessed in comparison to many. As long as we have it to give, we'll give. We probably should have given more when we had more, but somehow we just never really sat down and discussed the subject. Speaking of discussions, Mrs. Freeholder and I actually discuss money now. To be honest, money has never been a big interest for her, since she came from a family that had a surplus of it. With my background, I suppose I'm guilty of being a bit obsessive about it. For years, the family finances have been my "thing". Now that she's the breadwinner, she's taking much more interest in things. She is also discovering how much fun it is to be the breadwinner, and why men have traditionally died early. She's learning some difficult lessons in a hurry. It's a statement of the new depth of her financial understanding that she said a couple of weeks ago "No wonder you're always so grumpy about money." All this isn't to say that the last year has been a annus horribilis, because it hasn't. My health has improved in many ways, and I have no doubt that some of that is due to the overall reduction in stress, increase in exercise and improvement in eating habits. We have been able to take a couple of wonderful if relatively inexpensive (by our former standards) vacations. Our children are on the verge of flying the nest, which is both wonderful and terrifying at once. We're working out a new retirement plan. I guess you could say that it's been a lesson in what Jack Spirco of the Survival Podcast calls Modern Survivalism. It's building your life so that you're resilient when something you haven't planned for hits you. Being able to take that big hit and bounce back. I've planned for this point in my life since my 20s. I've not been obsessive about it, but I have thought about it considerably, and started putting away money toward it in my 30s, once I had a decent job and surplus money. Even at that, it's only been the last 10 years that have allowed us to build a life that was resilient enough to take a hit like this and keep on truckin'. I hope there is something you can take from this and put into practice in your own situation. Too many people aren't this resilient in their lives, and that's not good. Don't be one of them.